procedures take less than an hour. allow close together properly, they allow blood to flow downward, a condition called reflux. The blood travels back into the veins that branch out toward the surface, causing them to stretch and become painful. These enlarged, swollen blood vessels are known as varicose veins and are a direct result of increased pressure from reflux. The most common location of symptomatic reflux is the great saphenous vein, which runs down the inside of the thigh past the knee, followed by the short saphenous vein, which runs down the back of the calf below the knee. Reflux is diagnosed by a special ultrasound which can be ordered during a consultation with our doctors. 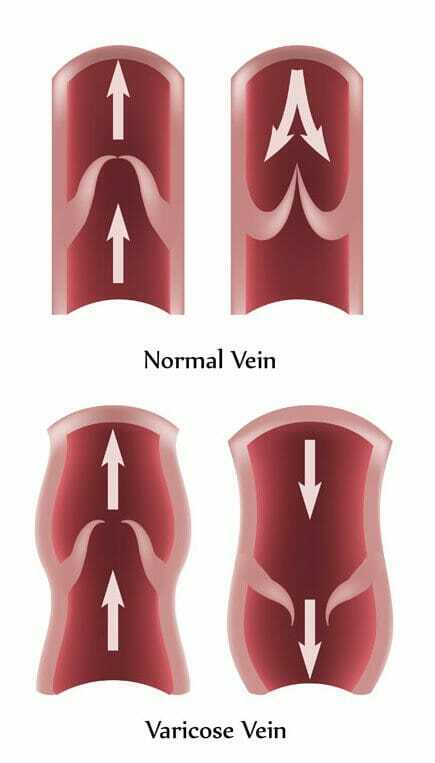 Once the vein is ablated, the body will redirect the blood to healthy leg veins. When there is less blood flowing backward down the leg, the unsightly varicose veins, reticular veins, and spider veins may shrink and become less noticeable. Sometimes, the varicose veins remain visible after a venous ablation is performed, or is not caused by reflux in any of the larger leg veins. 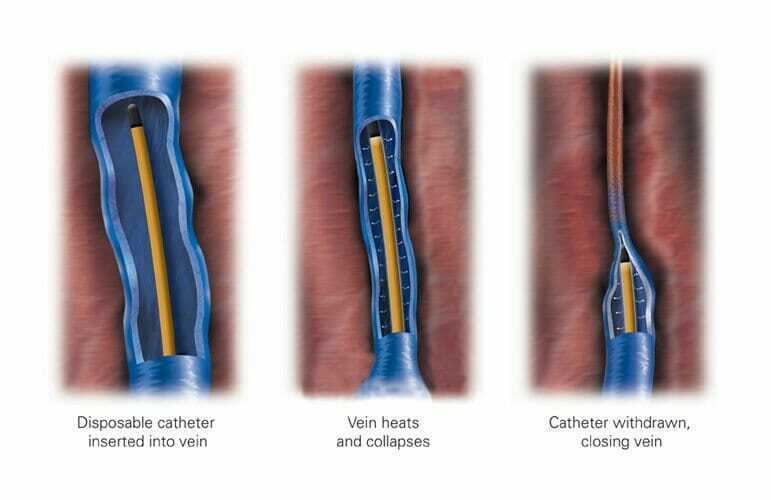 Another minimally-invasive technique that our doctors use to treat varicose or reticular veins is ambulatory phlebectomy. The abnormal vein is removed through tiny incisions using a special set of tools, including a vein hook (which looks like a tiny crochet needle). The procedure is performed under local anesthesia, and typically takes under an hour. Following the procedure, the affected part of the leg is wrapped for several days, followed by two weeks of compression to improve healing. Sclerotherapy can be used to treat some small varicose veins and nearly all spider veins. An extremely fine needle is inserted into the small blood vessel and a solution is injected which causes the vein to shrink and eventually be absorbed by the body.